During his 18-year career with the New York Yankees, Mickey Mantle became arguably the best hitting outfielder in Major League Baseball history and did it from both sides of the plate. A 20-time All-Star, Mantle won seven World Series championships, was a three-time American League MVP, led the AL in home runs four times and earned the Triple Crown in 1956. Mantle has his No. 7 retired by the Yankees franchise, was named to the MLB All-Century Team and was inducted into the National Baseball Hall of Fame in 1974 on the first ballot. Mantle earned one of those 20 All-Stars in 1953, hitting .295 with 21 home runs and 92 RBI. In the Yankees victory over the Dodgers in the 1953 World Series, Mantle first established his reputation for dominance in the Fall Classic, clouting two homers (including a grand slam) and posting seven RBI in the six game series. On the front left tail of this jersey is the "Tim McAuliffe" manufacturer's tag. Adjacent below are two box tags, one with the jersey size "44" (measures slightly larger) and another tag that reading “DRY CLEAN ONLY”. Below those tags reads "Mantle '54" in script style writing embroidered directly on the jersey in red. On the left breast is the "NY" logo. On the back is the player number "7." All lettering and numbering is done in blue felt. Mantle prominently signed the front of the jersey in black marker which has faded slightly over the years. All original Mickey Mantle pinstripe flannels are the most sought after and desirable relics in our hobby. It is an accepted and verified theory that teams would order new uniforms to be worn in the World Series that are tagged for the subsequent season. The Yankees have been known to specifically request that the Player IDs on the World Series uniforms be done with in red thread of which we have documented exemplars. Dave Grob of MEARS has authenticated this jersey giving it a perfect A10, specifically stating that it was worn in the 1953 World Series. We have been unable to locate an image conclusively photo-matching this jersey but can easily verify that the Yankees did in fact wear McAuliffe manufactured home jerseys in both the 1953 World Series and the 1954 regular season. It was submitted to an independent hobby photo-matching service with no conclusive match results by another auction house. The unique stitching application of the “NY” on this McAuliffe manufactured jersey can clearly be seen in in-game photography. This jersey is properly tagged, was presented to us as game-used and in our opinion shows appropriate use while remaining in fantastic all original condition. Minor fabric separation on the downward tilt of the “7” and a desirable level of light soiling to the players belt line is present adding to the jerseys appeal. Digital inspection of the Player ID “Mantle” reveals that the thread is darker at the points of entry & exit. The jersey first entered our hobby over 30 years ago and has been housed in some of the most well respected and admired collections. 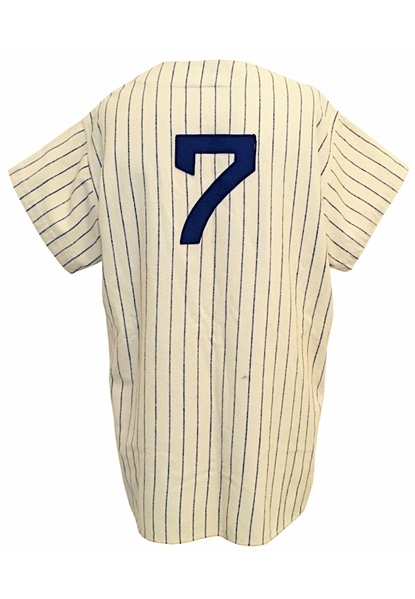 Accompanied by a Full LOA from JSA, a MEARS Graded A10 LOA as well as an additional report from Dave Grob stating that “this jersey was worn by New York Yankee center fielder Mickey Mantle during Games 1 and 6 of the 1953 World Series as well as for portions of the 1954 American League regular season”.